Athena wrote: Has anyone tried the beer flavored chips Aldi is selling right now? (Clancy brand, iirc, spotted them in the store yesterday). 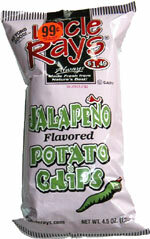 Does anyone remember Jay's 'Crazy Calypso' chips from the '80s or '90s? 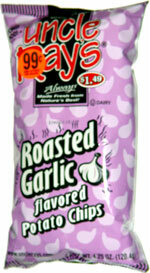 They were salty, spicy and sweet and came in a pink or purple bag. Loved those. Nothing less than Old Dutch : Dutch Crunch Kettle Chips for me. Farmer's Pride Produce at Chicago and Western Ave carries Uncle Ray's chips. They are in the process of remodeling and recently added a walk in beer cooler with a lot of local and craft offerings. I will be frequenting this grocery store on a much more regular basis with these recent changes. They've also expanded their wine/cheese offerings and appear to be trying to keep up with the changes in the neighborhood. I much prefer to visit a store of this size on weekends as the larger grocery chains are impossible to make a quick in/out stop, in addition to supporting the local/little guy. Back to the chips... unfortunately, I did not see some of the more unique flavors such as Dill, Roasted Garlic, Ketchup, or what peaked my interest in the first place: Coney. But given the recent changes to the store, next time I go I'll ask if they are willing to bring some other flavors in. 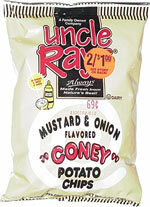 Sadly, the Uncle Ray's website (see below) does not list Coney as a current offering - but on a positive note, Jalapeno has returned (and is at Farmers Pride Produce). I'm originally from Northeast PA - which has many special treats, and even multiple websites offering mail order snacks for those transplants like myself (which I've never used). One of these snacks is Middleswarth chips - with a highly honorable mention to the BBQ. There is just something about these chips that makes them different. It's hard to describe or perhaps fathom, but they are more dense than a typical chip with more of a melty feel to them. However, they do not lack crunch and I would absolutely still describe them as light. Perhaps it's their use of vegetable shortening (per their website)? The only other chip I've had that was similar to them was from Larry's Market in Brown Deer, WI and I mistakenly did not commit the brand name to memory. If you fine yourself traveling through Pennsylvania and see these chips (remember, BBQ) - I recommend you give them a shot. They also offer a large family bag with a resealable top for your convenience. This year's Frito Lay flavor contest includes (per grub street) Kettle-Cooked Greektown Gyro, Wavy West Coast Truffle Fries, Southern Biscuits and Gravy, and New York Reuben. At least it isn't cappucino. The Truffle is likely to be vile truffle oil flavored. Not sure what Biscuits and Gravy would add. I'm hoping Gyros are good, the Reuben could go either way. I'm really enjoying the Route 11 Yukon Gold chips, which are a seasonal item. They're light, crispy, and well-salted, with no bitter off notes. 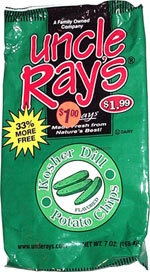 As far as I know, they're only only available through their website (in cases of 30 x 2-ounce bags). Needless to say, most of these will be going to my office for sharing . . . but not until Tuesday! ronnie_suburban wrote: I'm really enjoying the Route 11 Yukon Gold chips, which are a seasonal item. They're light, crispy, and well-salted, with no bitter off notes. Yukon Gold chips are in season, but currently sold out. Please check back! Whoa, that was fast! I'll save you a few bags. Also, fwiw, the Route 11 Lightly Salted chips -- not a seasonal item -- are also excellent. You can get them at Zier's in Wilmette, and probably at some other brick and mortar places in town. Or, you can order them online. Chef Jose Andres' potato chips are excellent. They're made in Spain using specially chosen potatoes, olive oil, and himalayan salt. I think they're probably made by Torres, but I'm not sure. Anyway, they're light, not greasy, just salty enough. I get them from La Tienda, but I think Amazon has them, too. They also have the Torres chips, and those come in different flavors. Also Chef Andres is a great humanitarian. I know it will go away but I prefer chips without ridges/wavy. I am a fan of the All DressedUp Chips. Ruffles make them, but folks were waiting for me to arrive at a cookout with the Roundy's version of them that happen to be sans ridges yesterday. They remembered the chips from last year and were waiting for me. I don't even think they stayed for burgers.